The College will host short updates from our observers to drafting projects and on other developments of interest to Fellows. Calls/webinars will be at 4 pm ET/1 pm PT (unless otherwise noted) on the specified date and are a benefit of fellowship in the College. Official Observer Program calls are free of charge to ACCFL fellows. Emails directly to ACCFL Fellows contain the call-in number. All information will be emailed to ACCFL Fellows. Tuesday, January 22, 2019, Fellows Paul Hodnefield (Corporate Service Company) and Darrell W. Pierce (Dykema Gossett PLLC) provided another in their series of presentations on developments in filing offices and procedures and related commercial law. In this perennial favorite, Paul and Darrell touched on activities of the ABA Business Law Section’s Joint Task Force on Filing Office Operations and Search Logic (FOOSL), the International Association of Commercial Administrators (IACA), and noteworthy legislative developments in the various states. December 18, 2018, College Fellows Teresa Wilton Harmon (Sidley Austin LLP) and Fellow Steven O. Weise (Proskauer Rose LLP ) provided an update on recent projects of the Permanent Editorial Board for Uniform Commercial Code (PEB), which met at the end of November. Composed of members from the American Law Institute and the Uniform Law Commission, the PEB monitors current drafting activities of the Uniform Commercial Code, and prepares commentaries and advises the ALI and the ULC on further changes needed in the UCC. These calls are always well attended; obviously, this is a highly interesting topic for many of our colleagues. Teresa and Steve are two of the six ALI members of the PEB. November 28, 2018, College Fellow (and then-Immediate Past President) Sylvia Fung Chin (White & Case LLP) provided a summary of developments and issues in legal opinion practice discussed at this fall’s sessions of the Working Group on Legal Opinions (WGLO). WGLO provides a national forum for the discussion of important issues relating to closing opinions in commercial transactions. Participants include opinion givers, opinion recipients, the ABA, state and local bars, as well as rating agencies, law firm malpractice insurers, and malpractice defense lawyers. Sylvia is the College’s designated representative to WGLO, and has provided updates on its proceedings more or less annually. July 12, 2018, Fellow Lawrence Safran (Latham & Watkins) provided an update on the Model Security Agreement for Limited Liability Company Interests. The model agreement is a product of the ABA Joint Task Force on Security Interests in Equity Interests of LLCs and Other Unincorporated Entities. The Task Force is jointly sponsored by the LLCs, Partnerships and Unincorporated Entities Committee, Commercial Finance Committee and Uniform Commercial Code Committee. Materials were provided. June 19, 2018, Fellows Steven L. Harris (Chicago-Kent College of Law), Edwin E. Smith (Morgan, Lewis & Bochius LLP), and Steven O. Weise (Proskauer Rose) presented an Update on the Legal Framework for Electronic Residential Mortgage Notes. The American Law Institute and the Uniform Law Commission have been working with the Federal Reserve Bank of New York on developing the legal framework for electronic residential mortgage notes that would be registered in a federal electronic repository. The project is unique since it involves the development of a federal statute to provide for the establishment and operation of the registry and, in parallel, for state law amendments to the Uniform Commercial Code to address the commercial law rules for electronic residential mortgage notes. Final drafts of the UCC amendments are before the American Law Institute and the Uniform Law Commission for approval shortly, with their promulgation being dependent upon the enactment of federal repository act. These drafts were discussed on the call. May 2, 2018, Immediate Past President Sylvia Chin (White & Case LLP) and Stanley Keller (Locke Lord LLP) presented Statement of Opinion Practices, along with other current opinion matters. Several years ago, the Working Group on Legal Opinions (“WGLO”) and the Legal Opinions Committee of the American Bar Association’s Business Law Section undertook a joint project to identify selected aspects of customary practice and other practices applicable to third-party legal opinions that are commonly understood and accepted throughout the United States. The result of the joint project efforts is a Statement of Opinion Practices designed to update the Legal Opinion Principles (53 Bus. Law. 831 (1998)) and selected provisions of the Guidelines for the Preparation of Closing Opinions (57 Bus. Law. 875 (2002)). In connection with preparation of the Statement, a more concise statement called the Core Opinion Principles, that was drawn from the Statement, has been prepared. It is designed for use for incorporation by reference in or as an attachment to an opinion letter by those who wish to do so. March 21, 2018, Fellows R. Marshall Grodner (McGlinchey Stafford PLLC) and Steven O. Weise (Proskauer Rose) discussed the most recent draft of a Report entitled "Uniform Commercial Code Opinions in Real Estate Finance Transaction Opinion Letters.” they provided the most recent draft of the Report and the accompanying Illustrative Opinion Letter for use during the call. The Report is a joint project of the College; the ABA Section of Real Property, Trust and Estate Law, Committee on Legal Opinions in Real Estate Transactions; the American College of Mortgage Attorneys, Opinions Committee; and the American College of Real Estate Lawyers, Attorneys’ Opinions Committee. It is the third in a series of reports dealing with opinions in real estate financing transactions. January 24, 2018, Fellow Teresa Wilton Harmon (Sidley Austin LLP) and Fellow Steven O. Weise (Proskauer) provided an update on recent Projects of the Permanent Editorial Board for Uniform Commercial Code. The conference call was exceptionally well attended; obviously a highly interesting topic for many of our colleagues. December 4, 2017, ACCFL President Sylvia Fung Chin (White & Case, LLP) updated the Fellowship on the most recent work of the Working Group on Legal Opinions (WGLO). November 7, 2017, Fellow Paul Hodnefield (Corporate Service Company) & Fellow Darrell Pierce (Dykema Gossett PLLC) reported on the ABA BLS Joint Taskforce on Filing Office Operations and Search Logic (FOOSL) and International Association of Commercial Administrators (IACA), with an update on legislative developments in filing and other commercial law matters. October 4, 2017, Fellow E. Carolan Berkley (Stradley Ronon Stevens & Young, LLP) presented an update on ULC Series of Unincorporated Business Entities Act. At its summer 2017 meeting, the Uniform Law Commission approved the Limited Liability Company Protected Series Act (the “Act”) after its final reading. Subject to some non-substantive fine tuning, the Act will be ready to go to state legislatures for introduction and adoption. Carolan walked us through the Act and how it is designed to protect the assets of one protected series from creditors of another protected series and of the series limited liability company. Carolan also highlighted the provisions of the Act intended to ensure that the series structure is transparent to third parties. July 31, 2017, Secretary Pamela Martinson (Sidley Austin) outlined the issues that arose just prior to, and at, the ULC Annual Meeting on July 14, and provided an update on the status of the Act and its path forward. The Uniform Law Commission (“ULC”) Drafting Committee on Regulation of Virtual Currency Businesses (the “Committee”) held a further meeting in March and did a full reading of the Act at the ULC Annual Meeting on July 14. In light of the rapid development of the virtual currency marketplace and interest in a common set of standards that would bring more certainty to regulation of participants in that marketplace, the ULC tasked the Committee with developing a draft uniform law on the regulation of virtual currency businesses (the “Act”). In the current draft, the Committee spent time considering whether user protections such as those contained in UCC Article 8 should be integrated into the Act. The decision was made to do so, but an 11th hour objection was voiced. These issues were discussed. January 24, 2017, Steve Weise (Proskauer Rose LLP), Sandra Rocks (Cleary Gottlieb), Edwin Smith (Morgan, Lewis & Bochius LLP), and Professor Carl Bjerre (University of Oregon School of Law) were the leaders of this briefing: The Hague Convention on Securities held with an Intermediary, Materials were shared with Fellows and included (1) the Convention, (2) Choice of Law flowchart, (3) an Explanatory Report, and (4) the Draft 2013 PEB Commentary. The Hague Securities Convention will go into effect in the United States on April 1, 2017. The Convention is a choice of law convention that addresses various issues relating to securities held with a bank, broker or clearing corporation in the indirect holding system. The Convention will in many cases preempt the choice of law rules in Articles 8 and 9 of the Uniform Commercial Code for securities held in the indirect holding system on a number of issues including determining the law applicable to the perfection and priority of security interests in the securities. Although the choice of law outcomes under the Convention will in most instances be the same as under Articles 8 and 9, there are some situations in which the outcomes will be different. Our panelists discussed these differences and how to prepare to address them. These issues are especially important to address, because the Convention will apply to pre-effective date transactions. December 14, 2016, Fellows Professor Neil Cohen (Brooklyn Law School) and Steve Weise (Proskauer Rose LLP), members of WG VI, described the Model Law (The UNCITRAL Model Law on Secured Transactions) and the current work of WG VI on a Guide to Enactment.The United Nations Commission on International Trade Law (UNCITRAL) Working Group VI (Security Interests) finalized its Model Law on Secured Transactions, available here. The UNCITRAL Model Law on Secured Transactions (the "Model Law") deals with security interests in all types of tangible and intangible movable property, such as goods, receivables, bank accounts, negotiable instruments, negotiable documents, non-intermediated securities and intellectual property with few exceptions, such as intermediated securities. The Model Law follows a unitary approach using one concept for all types of security interest, a functional approach under which the Model Law applies to all types of transaction that fulfill security purposes, such as a secured loan, retention-of-title sale or financial lease, and a comprehensive approach under which the Model Law applies to all types of asset, secured obligation, borrower and lender. In this way, the Model Law is intended to address the main problem of secured transactions laws around the world, that is, the multiplicity of regimes that creates gaps and inconsistencies.The Model Law includes a set of Model Registry Provisions (the "Model Provisions") that can be implemented in a statute or other type of legal instrument, or in both. The Model Provisions deal with the registration of notices of security interests in a publicly accessible Registry to make a security interest effective against third parties and to provide an objective basis for determining the priority of a security interest over the rights of competing claimants. By providing a transparent, comprehensive and rational legislative framework of secured financing, the Model Law is expected to have a beneficial impact on the availability and the cost of credit, in particular to small and medium-size enterprises in developing countries. This will not only assist in their market inclusion and alleviating poverty, but also contribute to achieving Goal 1 of the 17 Sustainable Development Goals on ending poverty. The Model Law is based on the United Nations Convention on the Assignment of Receivables in International Trade, the UNCITRAL Legislative Guide on Secured Transactions, the Supplement on Security Interests in Intellectual Property and the UNCITRAL Guide on the Implementation of a Security Rights Registry. For the treatment of security interests in insolvency, the Model Law relies on the recommendations of the UNCITRAL Legislative Guide on Secured Transactions and the UNCITRAL Legislative Guide on Insolvency Law. December 2, 2016, Pamela J. Martinson (Sidley Austin LLP), ACCFL's Secretary and Observer to the Uniform Law Commission’s Regulation of Virtual Currency Businesses Project, updated us on the most recent activities of the Project, including the late October meeting of the Drafting Committee. In light of the rapid development of the virtual currency marketplace and interest in a common set of standards that would bring more certainty to regulation of participants in that marketplace, the Drafting Committee is tasked with developing a draft uniform act on the regulation of virtual currency businesses. At the October meeting, the Drafting Committee considered whether user protections such as those contained in UCC Article 8 should be integrated into the uniform act, and pointedly welcomed input from all interested persons. "In the past, every Delaware statutory trust was a “separate legal entity.” Starting in August 2016, “separate legal entity” status is simply the default rule applicable to every Delaware statutory trust “unless otherwise provided in its certificate of trust and in its governing instrument." This flexibility is generally understood to be a response to those in the structured finance community that continue to use common law trusts, rather than Delaware statutory trusts, out of concern that the former may be treated more advantageously by certain regulators and others under applicable provisions of federal and other law. Where assets are held in common law trusts (and now, perhaps, Delaware statutory trusts as to which the default rule has been displaced) those assets are generally held in the name of the trustee. While perhaps solving one challenge, the amendment gives rise to another. This new option of being a non-entity raises several questions with respect to the application of Uniform Commercial Code Article 9 (“Article 9”). It is unclear whether a non-entity Delaware statutory trust is nonetheless a “registered organization” under Article 9, and, more fundamentally, whether it can fit within the definitional parameters of the term “debtor” as used in Article 9 parlance." July 18, 2016, ACCFL fellows Katherine Simpson Allen (co-chair of the Task Force) and Howard Darmstadter (editor of the Task Force) discussed the final draft of the Model Intellectual Property Security Agreement (MIPSA) on this briefing call. Links to, and copies of, the final draft of the report and the agreement were provided. Materials for the briefing included the Task Force Introductory Report and Background Considerations which can be downloaded as a pdf. The model agreement and introductory report are now available on-line in the Summer 2016 issue of The Business Lawyer (Vol. 71, No. 3). May 2, 2016, Pamela J. Martinson (Sidley Austin LLP), ACCFL's new Secretary, updated us on the Committee's most recent activities. The Uniform Law Commission (“ULC”) Drafting Committee on Regulation of Virtual Currency Businesses (the “Committee”) held recent meetings in February in Palo Alto and April in Chicago. In light of the rapid development of the virtual currency marketplace and interest in a common set of standards that would bring more certainty to regulation of participants in that marketplace, the ULC tasked the Committee with developing a draft uniform law on the regulation of virtual currency businesses. Given the difficulty of the issues presented and the evolving technology, the meetings to date have focused on resolving significant issues of scope and purpose so that a draft Act can now be produced for a first reading at the ULC Annual Meeting this coming summer. Helpful input has been received from many in industry. HERE IS A LINK to the most recent draft of the Act for you to download. Pam reported on the direction taken by the Committee and issues of particular import to the commercial finance industry. March 14, 2016, Fellows Professor Neil B. Cohen (Brooklyn Law School) and Steven O. Weise (Proskauer, Los Angeles) reported on the recent progress of the UNCITRAL Working Group. Meetings of the group are aimed toward final approval of the model law scheduled for this summer. The conference helped to educate the Fellows on this important upcoming development and get feedback from knowledgeable practitioners on clarifications or improvements that might be possible before the text is finalized. March 18, 2016 Briefing Call was presented by Fellow Larry Safran (Latham & Watkins, LLP). Larry reported on the work of ABA Joint Task Force on Security Interests in Equity Interests of LLCs and Other Unincorporated Entities towards a model Security Agreement for limited liability company interests. The current Draft Security Agreement was provided for download. February 12, 2016, Professor Stephen L. Sepinuck, ACCFL Fellow and the College's representative on Uniform Commercial Real Estate Receivership Act project, discussed the Act, which received final approval from the ULC in the summer of 2015. The call focused on the key features of the Act and why states should adopt it. A copy of the Act can be found here. January 12, 2016 ACCFL Fellow and Official Observer Sylvia Chin (White & Case LLP) updated us on developments and issues in legal opinion practice discussed at recent Working Group on Legal Opinions (WGLO) sessions. WGLO provides a national forum for the discussion of important issues relating to closing opinions in commercial transactions. Participants include opinion givers, opinion recipients, the ABA, state and local bars as well as rating agencies and law firm malpractice insurers. December 8, 2015, ACCFL Fellow and Official Observer Carolan E. Berkley (Stradley Ronon Stevens & Young, LLP) provided an update on the Uniform Law Commission drafting committee project for a Uniform Series of Unincorporated Business Entities Act. The drafting committee met during November 6-8, 2015, to continue its work. Series are quasi-distinct legal constructs existing within an overarching LLC. Protected series feature “internal shields” that protect the assets of one protected series from the creditors of the LLC or of other protected series. Traditional LLC liability shields, by contrast, protect the owners of the LLC from liability for obligations of the LLC. The seriesLLC structure lowers administrative expenses while maintaining separation of business activities. Some form of series LLC structure is currently available in fourteen states and the District of Columbia. The statutes are not uniform, whereas uniformity is a benefit offered by most other unincorporated business entity laws. The Drafting Committee is considering the ability of each series to be a separate legal entity, the nature of public filings necessary to establish the entity and preserve transparency, and the power of the entity to hold title to assets. November 18, 2015, Fellow Paul Hodnefield (Corporation Service Company) and ACCFL Treasurer Norm Powell (Young Conaway Stargatt & Taylor, LLP) presented an exceptionally well attended conference call about the Delaware Secretary of State’s Office requirement for UCC filings to be submitted electronically starting December 1, 2015. The discussion included the mechanics of various filing options and issues they present for secured parties and attorneys who deliver perfection opinions. Paul has also provided an ALERT about the North Dakota UCC electronic filing requirements. October 28, 2015, ACCFL fellow and Official Observer Pamela Martinson (Sidley Austin LLP) gave us a report on the first meeting of the ULC Drafting Committee on Regulation of Virtual Currencies. Q&A and discussion followed Pam’s presentation. 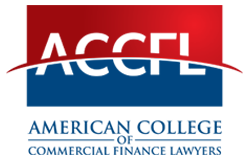 This was an exciting and unique opportunity for ACCFL fellows to participate in the development of new law in a rapidly growing sector of interest to commercial finance attorneys. June 25, 2015, College Observer E. Carolan Berkley provided an update on the Uniform Law Commission Drafting Committee Project for a Uniform Series of Unincorporated Business Entities in advance of the ULC Annual Meeting discussion in mid-July. Working Group on Legal Opinions (WGLO), Sylvia Fung Chin (June 17, 2015, December 11, 2014 and April 3, 2014). Sylvia presented slides and numerous other materials for attendees. Model Intellectual Property Security Agreement Joint Task Force (MIPSA), Katherine Simpson Allen and Howard Darmstadter (November 18, 2014 and March 27, 2014). Howard presented a May 2014 report. Visit the MIPSA Taskforce webpage for additional materials and information on Taskforce activities. June 10, 2015, International Association of Commercial Administrators (IACA) () Paul Hodnefield (Corporate Service Company) & Darrell Pierce (Dykema Gossett PLLC). IACA Model Administrative Rules (“MARS”) provide the framework for UCC operations at most state-level filing offices in the U.S. and also serve as a guide for those who search or file UCC records. This year, IACA approved the first significant changes to MARS since 2007. Discussed was the impact the new MARS will have on both filing offices and stakeholders, as well as the potentially serious consequences for those who file or search in states with rules that deviate substantially from MARS. The ABI Commission to Study the Reform of Chapter 11 plans to propose significant changes to Chapter 11 to reflect the development of the secured credit market since the last major revision of the Bankruptcy Code in 1978. The changes being discussed would be a complete rethinking of Chapter 11 reorganizations and could adversely affect secured creditors’ recovery from their collateral as well as the market for distressed credits. The panel provided an overview of the proposals and possible market impacts. Additional info about the Commission is available on the ABI website. Materials were provided. > Click here to access roster of drafting committee participants and observers. > Click here to access the article A Proposal for a National Mortgage Registry: MERS Done Right, 78 Missouri Law Review (2013). In this article, Prof. Dale Whitman analyzes the existing legal regime for the transfers of notes and mortgages on the secondary market, including the MERS system, and proposes an alternate system and model law. The College has been granted permission by the Missouri Law Review to post Prof. Whitman’s article, and we extend our thanks to them. Model Commercial Real Estate Receiverships Act (fka Model Act on Appointment and Powers of Real Estate Receivers), Prof. Stephen L. Sepinuck (February 26, 2015 and March 17, 2014). Prof. Sepinuck provided multiple materials for the calls. On February 25, 2015 WGLO provided a webinar on closing opinion issues relating to series entities.